This Mother’s Day give your mom a beauty-ful gift – the gift of youthful, flawless skin. Skin Again’s all-natural functional skin care creams contain the highest percentage of active ingredients that are clinically proven to give her visibly noticeable results. Now until May 31st, enjoy Buy One, Get one 50% off plus free shipping when you use promo code MOMS50 during checkout. Vanish designed to diminish the visibility of stretch marks, cellulite and scars, is perfect for new moms. Infused with powerful ingredients such as avocado seed extract, Shea butter and Bentonite. These actives act quickly to get your body back just in time for bikini season. Arm your favorite mom-on-the-go with two powerful SkinAgain first aid creams: Rescue and Relief, known to deliver fast-acting skin care solutions. Rescue, formulated to soothe burns, razor burns, cuts and scrapes, is the perfect sunburn and post-waxing cream delivering dramatic results. Relief relieves itchy, inflamed, red skin with aloe vera and chickweed extract. Even stylish moms need help at times to feel youthful, especially after how hard she works to take care of the family! Gift the glam mom in your life Youth, the legendary “fountain” in a bottle. Loaded with peptides and extracts, it’s designed to turn back the clock. Let her life experience, not her skin, reveal her ongoing zest for life! With each use, Mom will see her fine lines and wrinkles diminish before her eyes restoring elasticity and décolletage. Each product can be purchased starting at $38 and is TSA approved making it easy for moms to travel with their favorite skin care line. For remarkable before and after photos showing improvements in wrinkles, cellulite, stretch marks, dark spots, burns, and eczema, click HERE. You can even shop specifically based on your skin concern. 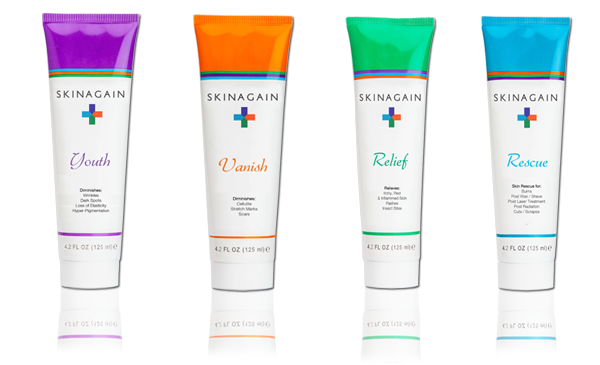 Visit www.skinagain.com to order or for more details. Their goal: We want you to love your skin.